When you're talking about scientists who achieved rock-star status in the second half of the twentieth century, the late astronomer and biologist Carl Sagan is right up there with Stephen Hawking. His Cosmos (1980) is one of the most popular science books ever written, planting itself on the New York Times bestseller list for 70 weeks and staying perpetually in print ever since. It was a companion for the PBS television series of the same name, which t along with numerous Tonight Show appearance t introduced Sagan and his emphatically stated phrase "billions and billions" into pop culture. His sole novel, Contact, was turned into a love-it-or-hate-it movie starring Jodie Foster as an erstwhile scientist searching for extraterrestrial life, with Matthew McConaughey as a New Age flake who, inevitably, makes his own form of contact with her. Besides his pop-culture credentials, Sagan was pals with numerous legendary Nobel Prizewinners while still in college, picked up a Pulitzer Prize for his book Dragons of Eden, and consulted for NASA, MIT, Cornell and RAND. He designed the human race's postcards to any aliens that might be out there t the plaque onboard the Pioneer space probes and the record on the Voyager probes. 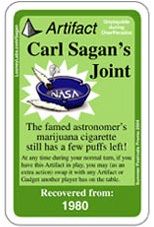 So it might come as a bit of a surprise that Sagan was an avid smoker of marijuana. Some might even call him a pothead. He believed the drug enhanced his creativity and insights. His closest friend of three decades, Harvard psychiatry professor Dr. Lester Grinspoon, a leading advocate of the decriminalization of marijuana, recalls an incident in the 1980s when one of his California admirers mailed him, unsolicited, some unusually high-quality pot. Grinspoon shared the joints with Sagan and his wife, Anne Druyan. Afterward, Sagan said, "Lester, I know you've only got one left, but could I have it? I've got serious work to do tomorrow and I could really use it." Perhaps letting Sagan bogart the pot was Grinspoon's way of returning a favor, since Sagan had contributed an essay to Marihuana Revisited, Grinspoon's classic 1971 book on the benefits and low risks of reefer. For almost three decades, the author of this ode to Mary Jane was anonymous, but in 1999 Grinspoon revealed that "Mr. X" was Sagan. I can remember one occasion, taking a shower with my wife while high, in which I had an idea on the origins and invalidities of racism in terms of Gaussian distribution curves. It was a point obvious [sic] in a way, but rarely talked about. I drew curves in soap on the shower wall, and went to write the idea down. One idea led to another, and at the end of about an hour of extremely hard work I had found I had written eleven short essays on a wide range of social, political, philosophical, and human biological topics... . I have used them in university commencement addresses, public lectures, and in my books. I do not consider myself a religious person in the usual sense, but there is a religious aspect to some highs. The heightened sensitivity in all areas gives me a feeling of communion with my surroundings, both animate and inanimate. Sometimes a kind of existential perception of the absurd comes over me and I see with awful certainty the hypocrisies and posturing of myself and my fellow man. And at other times, there is a different sense of the absurd, a playful and whimsical awareness... . I am convinced that there are genuine and valid levels of perception available with cannabis (and probably with other drugs) which are, through the defects of our society and our educational system, unavailable to us without such drugs. Such a remark applies not only to self-awareness and to intellectual pursuits, but also to perceptions of real people, a vastly enhanced sensitivity to facial expression, intonations, and choice of words which sometimes yields a rapport so close it's as if two people are reading each other's minds.